Trump has never threatened to destroy a subpoena on live television, but that’s precisely the sentiment we’ve heard from him throughout this presidency. The live, multi-hour, on-air meltdown of former Trump campaign advisor Sam Nunberg on Monday was the subject of many adjectives from pundits and commentators this week. It was “wild,” “staggering,” and even “surreal,” depending on your account of choice. More than one report termed Nunberg’s performance the unofficial start of “March Madness.” Nunberg may not have followed through with his pledged coup de grace — tearing up his subpoena from Mueller live on air — but by the end of the day, the document, which he waved wildly at times, would likely have welcomed the opportunity to be put out of its misery. But while the superlatives of cable news commentators were not unmerited, there’s another and perhaps wiser way to think of Nunberg’s performance: More of the same. Indeed, Nunberg’s televised rant was, at its core, not all that different from what we’ve seen from President Donald Trump over the course of many months. At the heart of Nunberg’s performance was a prevailing belief that he was above the law and not subject to the demands of federal law enforcement or the justice system. Sadly, that’s a belief he shares with his one-time boss and our current president. Nunberg’s behavior may well have personal consequences, but the results of a chief executive who believes himself infallible and untouchable are of much more national importance. Nunberg’s behavior may well have personal consequences, but the results of a chief executive who believes himself infallible are of much more national importance. Granted, Trump has never threatened to destroy a subpoena on live television, but that’s precisely the sentiment we’ve heard from him and his advisors throughout this presidency. It’s what Trump intimates every time he calls the Russia probe a “witch hunt,” his favored term for an investigation that the Deputy Attorney General — whom he appointed — oversees. Trump’s consistent recycling of this nonsensical term underscores his apparent failure to understand or accept that no one —not even the president — is above law enforcement scrutiny. But Trump’s efforts to escape the long arm of justice go well beyond his concerted attempts to discredit it rhetorically. 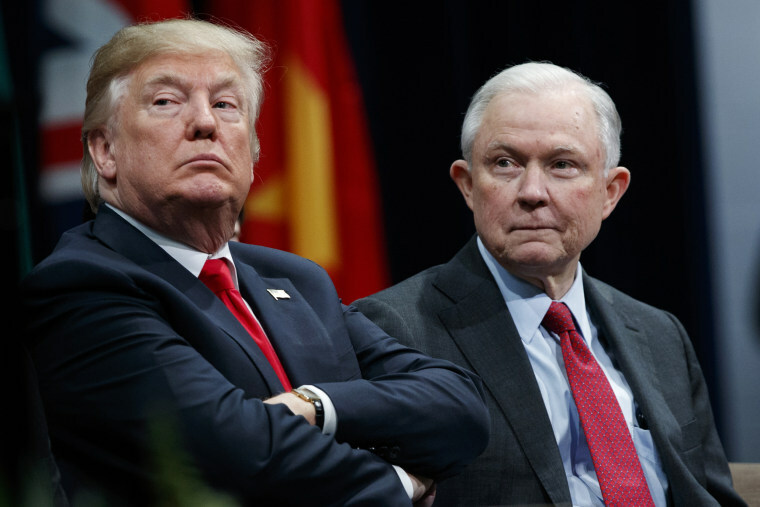 At the heart of Trump’s turbulent relationship with Attorney General Jeff Sessions is the latter’s decision early last year to recuse himself from overseeing the investigation into the Trump campaign and related matters. Trump reportedly lobbied hard to keep Sessions on the case, ordering his own White House counsel to prevent Sessions from jumping ship. While souring Trump’s relationship with Sessions, the ultimately unsuccessful effort revealed that this president apparently conceived of his attorney general as a personal defender, a watchdog to ensure the investigation didn’t get too close. As if to underscore this point, Trump has also spoken admirably of former Attorney General Eric Holder, who he told the New York Times in December had “totally protected” President Barack Obama. Holder recently denied these claims, noting he served a president who didn’t need protection. But the fact that Trump would even think to make such a comment is further (and startling) proof of his perceived definition of the presidential-attorney general relationship. Sessions’ eventual recusal failed to deter Trump, who subsequently took his defense into his own hands — or, more specifically, his own thumbs. Time and again, Trump has tweeted what could be construed as edicts in the direction of his attorney general and the broader Department of Justice. He has asked, in 280 characters or fewer, why the “beleaguered” attorney general demonstrated no apparent interest in investigating Trump’s political rivals, namely Hillary Clinton. The president has not explicitly directed the Justice Department to drop the Russia probe — at least not publicly — but he has repeatedly suggested the department’s focus is misplaced. No tweet better captured the president’s “l'etat c'est moi” mentality towards law enforcement—as well as his casual cruelty—than his claim in February that the Russia investigation had distracted the FBI and kept it from preventing the Parkland school massacre. More unfortunately, the president is not alone in his efforts to elude justice. In much the way Nunberg threatened to defy the special counsel’s subpoena, Trump’s team of lawyers reportedly have spent weeks determining how to escape the prospect of a presidential interview with Mueller’s team. Some of the alleged ideas have been harebrained — including the notion that federal investigators would be content with a written statement — while others have exuded the same defiance of law enforcement that was broadcast this week. The president has not explicitly directed the Justice Department to drop the Russia probe but he has repeatedly suggested the department’s focus is misplaced. Donald Trump and Sam Nunberg have had no shortage of bad blood since Nunberg’s dismissal from the Trump campaign in 2015, and Nunberg did not hesitate to criticize and even implicate his erstwhile boss during his recent interviews. Whether Nunberg likes it or not, however, he is heading down the same path that Trump, with the help of his attorneys, has cleared over the course of months. With every tweet and pronouncement aimed at the Russia probe, the president has signaled his contention that justice is not blind after all. Ned Price served as a special assistant to President Barack Obama on the National Security Council staff. Prior to serving at the White House, he was a spokesperson, briefer and senior analyst at the Central Intelligence Agency. He is currently an NBC News analyst and contributor, a lecturer at George Washington University and a fellow with the New America Foundation. Ned Price served as a special assistant to President Barack Obama on the National Security Council staff, where he also was the spokesperson and Senior Director for Strategic Communications. Prior to serving at the White House, Ned was at the Central Intelligence Agency, where he was a senior analyst and spokesperson. He currently directs Policy and Communications at National Security Action, is an NBC News analyst and contributor, and teaches at Georgetown University. He holds degrees from Georgetown and Harvard.